Will Juno Confirm a New Theory? Last edited by geckzilla on Wed Dec 20, 2017 4:28 am, edited 1 time in total. Reason: Edited by request of post author. What would Orion look like if our solar system was 500 light years closer to its nebulae? We would probably have a view like this in the night sky. Not being able to capture one of the telescopes of La Palma Observatory in a single frame at the same focal length as the background (Because of the time of exposure and because the perimeter is off limits at night), I used two different lenses for the background (135mm) and foreground (14mm) to capture the detail of the Orion area and as much detail of the telescope at the same time. Both parts were taken at the exact same location and time of night. Orion is probably the most iconic constellation of the Fall and Winter all around the world. It is so majestic from all perspectives. With the naked eye, the brightest stars really do form a character holding a bow. 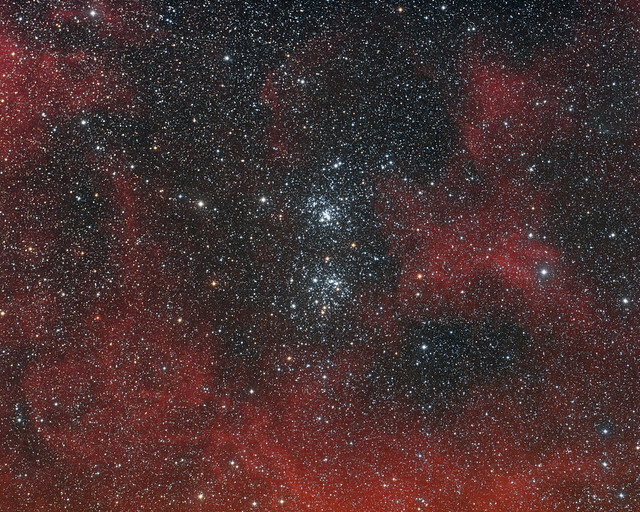 Using an astro modified camera that lets all the H-alpha emissions be captured, the Orion region becomes a marvel to gaze at, strewed with cooling gas from previously exploded stars. Among this colorful and eerie graveyard, stars are also being born in a gigantic nursery. It's incredible to get so much detail and colors using a 135mm lens. I am usually for showing nature as it is, but depending how you are using it (strictly scientific or as art), your view is extremely subjective. Even your camera doesn't 'see' as you do. While science should remain as objective and factual as possible, it's communication and education should be fun, innovative, creative and subjective, as this composition suggests. Last edited by Adrien Mauduit on Fri Dec 01, 2017 3:12 pm, edited 1 time in total. There is one good and obvious reason why the Observatory has been built at the very top of this dormant volcano: it is situated at 2400m of altitude and benefits from year-round dark and pure skies. Although there is still some light pollution from the El Paso area, and because it also receives humid air from the sea and also dust from the Sahara nearby, the air is of an unprecedented quality and it's very dark up there. You cannot see a thing and even the night sky is illuminating the foreground, which rarely happen because of the expansion of mankind and light pollution. The Observatory is comprised of several telescopes and parabolas including the MAGIC mirrors and the great telescope (GTC: Gran Telescopio Canarias). Although the area is off limits at night, the area is accessible if you are willing to hike around the perimeter (200 m high). I took this pristine shot of the Fall milky way and its disappearing core, which was greeted by a brilliant display of zodiacal light (sunlit interplanetary dust) and Saturn setting as well ('yellow star'). I have rarely taken a shot this 'easy', meaning without that much post-process to reduce noise and increase contrasts, because the air is so pure and the airglow wasn't too strong that night. On the night of November 22nd 2017, I decided to take a time-lapse of the pleiades and the california nebula to show the color difference of the two completely different objects, the one star cluster reflecting its light onto a passing gas cloud, and the other one a faint emission nebula, well visible with a modified camera. As I scrolled through my shots, two northern Taurid meteors photobombed the frame taken at 135mm. I stacked 50 frames plus the two containing the two meteors into one to reduce noise and increased contrasts. It was very challenging for me because I was not in the comfort of my home, but on vacation on La Palma in the Canary Islands, and on top of the volcano, the wind picked up to 20 m/s! I had to reduce my exposure time to 15 seconds, as the pictures were tracked with the Vixen Polarie. I also used a light pollution filter (Pure night by Lonely Speck), but the gear used remained very simple. I love that we are able to achieve wonders like this with such little equipment these days! In the night of November 21st-22nd (last night), I was out shooting a time-lapse of the milky way On La Palma in the Canary Islands when some clouds rolled in along with thunderstorm that developed on the Atlantic ocean (west). At first nothing major, but as I played back my time-lapse on the LCD screen of my Canon 6D camera, what a surprise I had when I saw the 'red dots' on the very right-hand side of the frame. Red dots, because I was shooting with a 14mm lens. As I zoomed in to only confirm my suspicions, I could not contain my excitement: I had caught my very first red sprites. Not only that, but with a very cool combination of events: Fall milky way and zodiacal lights (as I shot around 20:00, a bit more than an hour after LT sunset), orange airglow (barely visible here on the horizon but more visible earlier in the time-lapse, and of course lightning and sprites. I had been waiting years to capture this elusive phenomenon, and tried countless times in vain. What a surprise and a memory of a lifetime! Canon 6D Baader modded + Sigma 14mm f/1.4 Art, @ ISO 6400, f/2, 15'', single shot, no tracking. 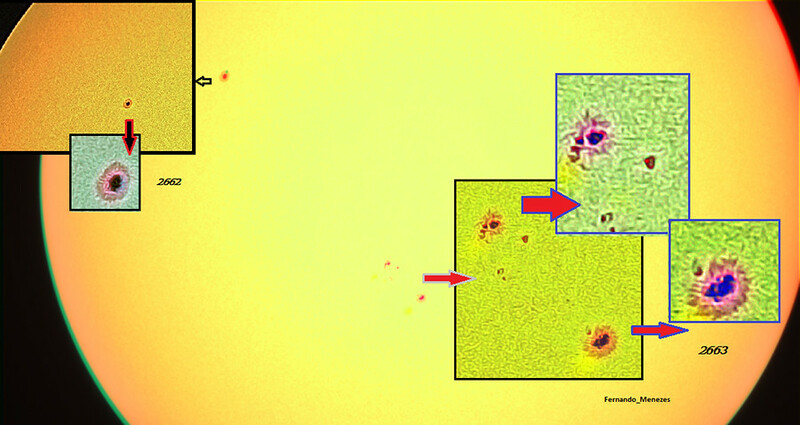 LRGB taken from Arizona sky at San Pedro Valley Observatory; Takahashi TSA 102 and Sbig STXL 16200; the composition has tried to compensate for the rapid moviment of the comet with a double processing: one for the comet and one for the nebula. 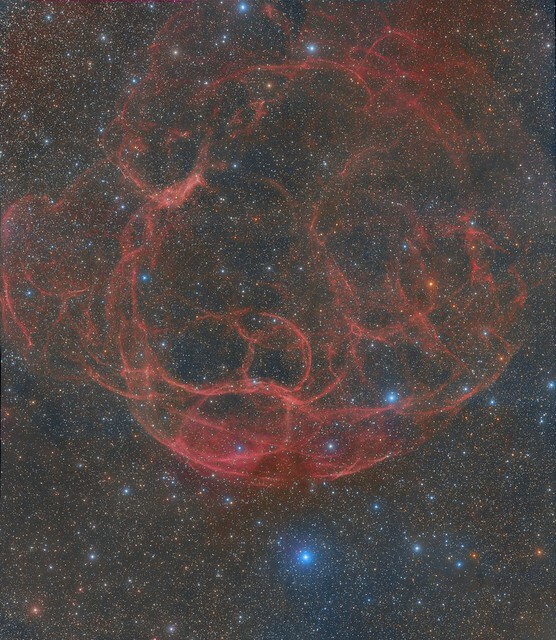 Mosaic of Simeis 147 from Arizona Sky at San Pedro Valley Observatory. Last edited by bystander on Sat Dec 02, 2017 1:49 am, edited 1 time in total. This is an astrophotography of a beautiful conjunction on July 18, 2015. The Moon (left), Venus (upper), Jupiter with moons (bottom) and star Regulus (right) showing a cross in the west at an early twlight. I did this photo with a 135mm lens and Canon EOS T3i. WeBo 1 - a planetary nebula in IC1805. Hi, I'd like to submit the attached picture. It's a star trails composition showing the South Celestial Pole. I took it on Nov 23rd at Talampaya National Park in Argentina, a UNESCO world Heritage Site, famous for its peculiar rock formations in a deep red color, resembling a Martian landscape. The star trails were captured in a timespan of approximately three hours. The prominent rock formation at the center, fittingly called "The Tower", and its surrounding landscape can bee seen being softly lit by a waxing crescent moon as it was setting in the west. The first planet found with the aid of a telescope, Uranus was discovered in 1781 by astronomer William Herschel, although he originally thought it was either a comet or a star. Uranus is 4 times wider than Earth. Uranus is one of two ice giants in the outer solar system (the other is Neptune). Most (80 percent or more) of the planet's mass is made up of a hot dense fluid of "icy" materials - water, methane and ammonia - above a small rocky core. Near the core, it heats up to 9,000 degrees Fahrenheit (4,982 degrees Celsius). All of Uranus's inner moons (those observed by Voyager 2) appear to be roughly half water ice and half rock. The composition of the moons outside the orbit of Oberon remains unknown, but they are likely captured asteroids. Last edited by bystander on Sat Dec 02, 2017 3:07 pm, edited 1 time in total. Last edited by bystander on Sun Dec 03, 2017 7:42 pm, edited 1 time in total. Last edited by bystander on Sun Dec 03, 2017 7:43 pm, edited 1 time in total. Last edited by bystander on Mon Dec 04, 2017 2:53 am, edited 1 time in total. RGB: R 35x2min, G 35x2min, B 35x2min. Calibrated with Dark, Bias and Flat. Processed with: MaximDL5, StarTools1.4, Lilu, Paint Shop Pro X9 and Plug-in Nik, Topaz Details and StarSpike Pro.